Be ready to have a fun time learning! Woohoo! Are you worried about hackers social engineering you for your sensitive files, business emails, or access to your computer? Are you concerned about being scammed on the Internet, or when using your mobile phone? Are you scared your passwords will be stolen? Do you want to learn basic cyber security & social engineering awareness, BUT in an entertaining, effective, and memorable way? Do you want to understand, in simple plain English, how so many businesses are being hacked into every day? Do you want to be taught, using only stimulating visuals, how to securely manage all your emails, passwords, and browsing on the Internet? I understand why you might be reluctant to take cyber security training, because you're worried its either boring, or maybe too technical for you to understand. Which is why I designed this beginners course for anyone looking for non-technical, fun, and engaging cyber security training! This course is designed to teach you the basics of cyber security awareness, and social engineering, even if you have no IT / Cyber Security experience or knowledge. Whether you are a beginner in IT, or advanced, this course is designed for all of you to enjoy watching, because I made sure the curriculum was comprehensive enough to give you all the information you need to stay secure online, and presented to you in a simple and entertaining way. Essentially, you will be transforming - from someone who might feel vulnerable or insecure when on the Internet - to someone who can CONFIDENTLY and SECURELY manage emails, browse the Internet, and use mobile devices and computers. What makes my course different, is that I use visuals, humor and storytelling throughout the training, to make it as effective, memorable and entertaining as possible for you! The training is literally 98% images and illustrations - no boring PowerPoint slides! Furthermore, the entire time I was recording in studio, I kept thinking to myself "how can I make this material really fun and interesting??" I really tried to put myself in the mind of my students, so that I could present the information in a way that you would find interesting and engaging. This course has 41 brand new security training videos, covering over 30 cyber security subjects. It's me in front of the camera, speaking passionately from the heart, and talking directly to you about the biggest cyber security threats facing you today. It's packed with the latest tricks hackers and scammers are using to social engineer you for your data and money. We will cover everything: email phishing, malicious s, insecure browsers, evil mobile apps, how to secure your mobile phones, Macs, Windows, social media, Internet privacy, anonymity, encryption.plus much much more! Please look at each video module description below for more details. Just as important: I wanted to make sure the training course was very focused, so it can be watched by anyone in a reasonable about of time. As a result, I intentionally kept the training to around 3.5 hours, so that your course is comprehensive/complete, but to the point! For me, its all about helping you understand the core fundamentals, and as quickly as possible. You will receive really effective, fun & memorable awareness training! You won't spend hours looking at boring PowerPoint slides! I can honestly say this training will positively change your life in a big way! And I promise you will learn some REALLY valuable cyber security skills, and have a ton of FUN along the way. Click the Enroll button now! I can't wait to see you in the course! You will learn who the various types of hacker entities are out in the world today, as well as their various agendas and tactics. You will see numerous examples of targeted phishing emails, and then be taught in-depth how to recognize some of the major red flags, so that you can readily detect these emails in the future. You will see a number of ways in which hackers and scammers are social engineering us, via emails and webpages. Even more major red flags are exposed, so you learn the common patterns, and how they can be caught easily. You will learn all about Macro malware, why they are so popular, how to easily spot malicious macros, as well as protect yourself against them. You will learn about Business Email Compromise attacks, also known as 'CEO Fraud'. You will visually see how they trick us into initiating large wire transfers, what the red flags are, and then you will learn how to stop these dangerous attacks right in their tracks! You will learn how similar Messaging attacks are to other common social engineering methods, as well as why they are used just as effectively by the bad guys as phishing emails to hack you. You will be shown examples of social engineering using SMS text messaging on your mobile device, as well as the red flags that can be easily spotted in these attacks. You will learn about social engineering by spoofing Caller ID numbers, and calling us on our phones, asking for money, personal information or access to our computers. You will also be played several audio tracks of actual Vishing attacks. 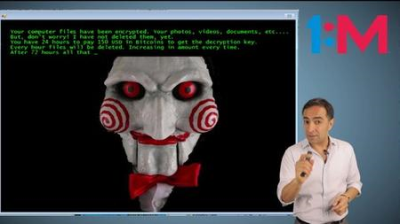 You will understand why ransomware attacks are so effective in forcing their victims to hand over money, see various examples of what they look like, and most importantly, how to prevent being a ransomware victim. You will see visual examples of cryptomining attacks, and learn how to prevent yourself from being a victim of such an attack, as well as be taught various ways of detecting them. You will revisit all the major social engineering red flags that you can spot in targeted phishing emails, texts, phone calls, and social engineering attacks in general. You will understand the main emotions that social engineers try to invoke in you, to make you do what they want. You will also go over, in detail, how to detect, and respond accordingly, to a phishing attack against you. You will learn how search engines are exploited, so that hackers can deliver malware to your system, phish you for your credentials, as well as social engineer you into handing over your private information. You will learn what Banking Trojans are, a common type of cyber attack that effectively depletes your bank accounts of funds, and the various ways you can be infected with one. You will learn about Fake AntiVirus, a very effective and successful method of socially engineering people into handing over their credit card details, by presenting them with fake anti-virus alerts. You will learn the general differences in security between iPhones and Androids, some of their main security features, how to avoid ing malicious apps, and much more! You will understand the major issues around password management, how to keep track of ALL of your passwords in a secure manner, and why sharing weak passwords across multiple websites is something you need to address today! You will learn all about the various types of 2-Factor Authentication, how they prevent hackers hijacking your account, as well as understand why 2FA also greatly helps mitigate the risks with using the same weak passwords across websites. You will be presented with the main privacy and security strengths/weaknesses when it comes to using the major browsers, with invasive and dangerous things such as browser scripts, trackers, cookies and fake browser updates. You will then be shown, using visual examples, all the different ways you can securely lock down your browser from the bad guys, as well as invasive marketing companies that want to track your browsing habits! You will learn how social media websites are the perfect platform for ing malware, and being scammed into parting with our private and sensitive information. You will also be taught red flags to spot whenever you come across fraudulent posts on social media. You will learn, using actual images on social media, of how nation states, and ideologues, have exploited the platform to spread misinformation/false news. You will understand how these campaigns have been so effective, and why all of this is significant from a cyber security perspective! You will be presented with the main issues around the industrial-level analysis, and trading of our private data, by certain browsers, marketing firms and tech companies. You will come to understand when you are using popular free services on the Internet, that much of your behavior/interests/habits are being analyzed and profiled for future advertising. You will learn how devastating the Equifax hack was for most of us, and how you can protect your credit profile, with some really amazing and easy solutions you can implement in minutes, in light of all the large data breaches that have occurred in recent years. You will learn about all of the great data privacy rights we now have with GDPR regulation in the EU. You will be taught the main rules around GDPR that are forcing Internet companies to handle your private data securely, and how it can help protect US citizen data as well from prying hands. You will learn all about what encryption is, why it is so very important to enforce security and privacy, and then you will be presented with some common encryption solutions you can use both at home, and at work. You will learn all about the major security issues involving IoT connected devices, and be visually guided, step-by-step, through how you can secure your devices to prevent hackers from infiltrating your home network and connected devices. We will review for you again all the great cyber security solutions presented in the training, plus even more cool tips 'n tricks on how to protect yourself when using computers, smartphones and the Internet. So if all of these sound appealing to you, enroll in the course! You will have lifetime access to the course! There are 41 videos, and I intentionally made the course 3.5 hours, so that you don't feel the material is too long or boring. Most videos are 2-5 minutes long. What if I need any help while taking the course? Is there a deadline to complete the training? There is no start or end date. Absolutely. On your checkout page (under the "Billing Information" section), choose the icon with the small 'P'. Can I receive CPE credits for taking this course? Indeed, you can! You will need to submit for your CPE credits separately outside of Udemy. Do I have to write a bunch of notes to keep up with the training material? Not if you don't want to! I included a 50-page Bonus Supplemental Guide that has all the training material, and much more, so that you can sit back, relax, and watch with ease. What if for any reason I am not happy with the course?